World-renowned, The Fairmont San Francisco hotel presents an awe-inspiring picture of historic San Francisco. The grandeur of the hotel coupled with its reputation for impeccable service promises a truly memorable experience. Known for turning moments into memories for leisure and business travelers alike this luxury San Francisco hotel has been host to some of the most influential meetings and events, breathtaking weddings and personalized special occasions of the century. Each of the San Francisco hotel’s spacious guestrooms and suites have been elegantly updated including flat screen TVs, Frette linen ensembles, pillow top beds, and MP3 docking stations. In addition to its 591 guest rooms and suites this luxury San Francisco hotel offers fine dining with three renowned restaurants and lounges, as well as 55,000 square feet of spectacular function space. With a panoramic view of the City and the Bay from high atop Nob Hill, The Fairmont San Francisco hotel presents an unmatched blend of luxurious accommodations, elegant meeting spaces and superb services, which make for an unforgettable stay. Centrally located, this luxury San Francisco hotel is a short cable car trip from the bustling Downtown, Financial District, Union Square and Fisherman’s Wharf. In fact, The Fairmont San Francisco hotel is the only spot in San Francisco where each of the City’s cable car lines meet. Fairmont President’s Club is our recognition program designed around your passions and what is important to you. As a member, you will discover a world of benefits and privileges that provide convenience when you travel and access to exclusive offerings and experiences. Nestled in one of San Francisco’s most prized neighborhoods, Club One at Nob Hill sits inside the Fairmont Hotel. Offering a full-service luxury spa this club remains a favorite for locals and hotel guests alike. Hours of Operation: Please call (415) 834-1010 for hours of operation. Located conveniently on the Terrace Level of The Fairmont San Francisco, Club One at Nob Hill offers a luxurious, comfortable environment for exercise – and the ultimate San Francisco spa experience. The Club features state-of-the-art Techno gym cardio and strength training equipment. Our San Francisco spa hotel’s health club is free of charge for Fairmont President’s Club guests. $15 USD for non-members. $10 per day charge for 2-5 days of consecutive usage. Monday to Friday: 5:00 a.m. to 10:00 p.m.
Saturday and Sunday: 7:00 a.m. to 7:00 p.m. Please note our San Francisco spa hotel does not offer a pool. The Business Center is available to guests 24 hours 7 days a week, with a room key. An attendant is available for your convenience during the hours of; Monday- Friday 7:00 a.m. to 5:00 p.m. and Saturday 8:00 a.m. to 4:00 p.m.
Complimentary amenity kits for Babies & Tots include a Sammy the Seal stuffed animal, no-tears hair wash, cleansing soap, toothbrush & paste, bubble bath and gentle lotion. The Fairmont San Francisco uses the services of the Bay Area Child-Care Agency, a well-known babysitting company in San Francisco. Bay Area Child-Care Agency will provide your family with childcare support during the day, for those special evenings away, weekends and holidays. For information and reservations, please contact the hotel’s Concierge, or call owner Gordon Fong at: (415) 309-5662. At all Fairmont hotels, kids aged five and under eat free off the children’s menu while kids aged six to eleven eat for half price off the regular menu. New this year: The expansion of the brand’s Lifestyle Cuisine program to children’s menus – offering a healthy twist on the usual kid-friendly favorites such as chicken strips, pizza, spaghetti with meatballs and even chocolate mousse. Chefs are in the process of swapping out refined flour for whole wheat, incorporating fruits and vegetables into recipes to help meet the recommended daily fiber allowance, and employing alternative cooking methods to help ensure healthier choices are made available to young diners. Since 1907, the Fairmont Hotel has been host to the most important meetings and events held in San Francisco. So it was natural that in 1945, delegates from 40 countries around the World met in the historic Garden Room to draft the Charter for the United Nations. Our expert staff and state-of-the-art meeting facilities at The Fairmont San Francisco help create the perfect venue for conference and events ranging from a Board of Directors Meeting to the Grandest of Galas. San Francisco is well known for its World-class shopping; fabulous restaurants and incredible architecture. And The Fairmont San Francisco Hotel is set right in the middle of it all. At The Fairmont San Francisco, our dedicated and experienced wedding and event professionals provide warm and intuitive service throughout the planning experience. Your personal San Francisco wedding and event specialist will expertly coordinate every aspect of your very special occasion. No detail is too small or outside the realm of their expertise, allowing you the ability to enjoy your Bay Area wedding with confidence and comfort. In the famed Venetian Room, Tony Bennett first sang, ‘I Left my Heart in San Francisco.’ And in 1945, delegates from 40 countries around the World met in the historic Garden Room to draft the Charter for the United Nations. The Fairmont San Francisco has been host to the most remarkable events in San Francisco history. Your wedding reception or social occasion may soon be among them. The Fairmont San Francisco hotel provides accommodations that are a testament to luxury with 591 individually furnished and decorated guest rooms. The 62 elegant suites offer impressive views of the City and Bay. The Fairmont hotel in San Francisco, CA, is an ideal escape. Built in 1907, the hotel combines a classic ambience with modern amenities. For business travelers, The Fairmont San Francisco hotel accommodations features include a spacious work desk, multi-line telephone with voice-mail and High Speed Internet Access. Please see the Guest Room and Suites & Specialty Rooms sections at left for complete descriptions of our accommodations in San Francisco. The following amenities may be available in selected San Francisco hotel rooms. Please indicate the request in your on-line hotel reservation, or ask one of our reservation agents. * There are 12 rooms at the hotel which are specially adapted for physically challenged guests. These rooms are in full compliance with the Americans with Disabilities Act. The Housekeeping Department can also provide raised toilet seats and shower chairs upon request. Recently restored to their original splendor, these Fairmont San Francisco hotel rooms are cozy and quiet. Located on floors two through six in the historical seven-story main building, they are beautifully decorated with royal blues and golds, and each has a marble bath. All rooms have also been updated with flat-screen TVs, Frette linen ensembles, pillow top beds, and MP3 docking stations. All of these cozy San Francisco hotel rooms have windows that open and face the interior rooftop of the Main Building. The Fairmont Exterior rooms have been beautifully restored, and come complete with marble baths, large desks and sitting areas. With 14-foot vaulted ceilings, these San Francisco hotel rooms are quite large and are located on floors two through six in the historical seven-story Main Building. 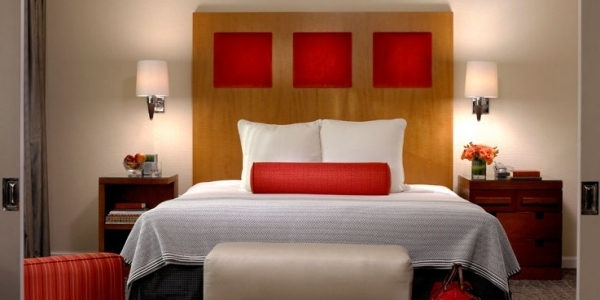 All rooms have also been updated with flat-panel TVs, Frette linen ensembles, pillow top beds, and MP3 docking stations. 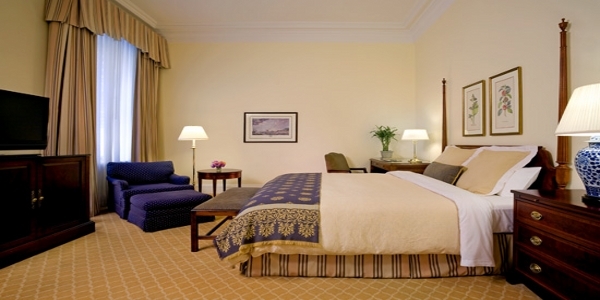 The Fairmont Exterior rooms also feature windows that open and boast stunning city views. Deluxe rooms are located in the Tower building. The Tower is a more contemporary building and was built to take advantage of the stunning views atop Nob Hill. All rooms have been completely renovated, and include oversized marble baths with separate showers and tubs, as well large desks and sitting areas. These stylish San Francisco hotel rooms have also have been updated with flat screen TVs, Frette linen ensembles, pillow top beds, and MP3 docking stations. They also feature picture windows with unrivalled skyline views. Signature rooms are located in the Tower facing the San Francisco bay. The Tower is a more contemporary building, and was built to take advantage of the stunning views atop Nob Hill. All rooms have been completely renovated, and include oversized marble baths with separate showers and tubs, as well as large desks and sitting areas. These stylish San Francisco hotel rooms have also been updated with flat-screen TVs, Frette linen ensembles, pillow top beds, and MP3 docking stations. These spacious San Francisco hotel rooms also feature picture windows with unparalleled views of the Bay. The following amenities may be available in selected San Francisco hotel suites and specialty rooms. Please indicate the request when making your reservation. 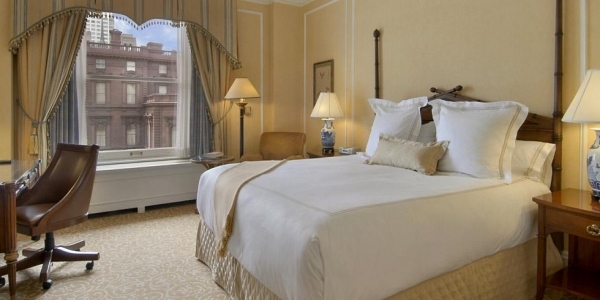 Main Building Suites at The Fairmont San Francisco hotel have a spacious parlor, bedroom and marble bathroom. The bedroom and living room are separated by a door for privacy. Each of these distinctive San Francisco suites are unique in decor, layout and size, but all feature updated amenities including Frette linen ensembles, flat-panel TVs and Bose sound systems. An additional bedroom can be added to form a Two-Bedroom Suite. Suites can also easily accommodate a rollaway bed. Main Building Balcony Suites at The Fairmont San Francisco feature an ornately filigreed terrace, an elegant parlor, bedroom and marble bath. The bedroom and living room are separated by a door for privacy. Each of these graceful San Francisco suites are unique in decor, layout and size, but all feature updated amenities including Frette linen ensembles, flat-panel TVs and MP3 docking station. An additional bedroom can be added to form a Two-Bedroom Suite. Suites can also easily accommodate a rollaway bed. 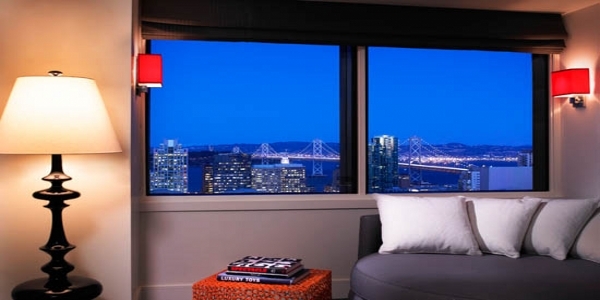 Tower Suites at The Fairmont San Francisco hotel afford the most breathtaking views of San Francisco. Contemporary in design, Tower Suites are bordered by large picture windows and equipped with telescopes to capture views from the bedroom and living room. These luxurious San Francisco suites can easily accommodate 12 people for entertaining. Tower Suites have a spectacular marble bathroom with separate bath and shower. All suites have been updated with flat-panel TVs, Frette linen ensembles, pillow top beds, MP3 docking stations in the bedroom and a Bose sound system in the living room. Tower Suites also can be connected to a second bedroom with either one King bed or two Queen beds, based on availability. A parquet floor entrance leads to a wood-paneled parlour with a decorative fireplace and dry bar in the Buckingham Suite, which also features a glass-enclosed balcony that overlooks the city’s stunning skyline. This sophisticated San Francisco suite easily accommodates up to 20 people for entertaining. Residential in style, the Cambridge Suite at The Fairmont San Francisco hotel offers views of the beautiful Grace Cathedral, Pacific Union Building (formerly the Flood Mansion), and overlooks the ornate flags in front of the hotel, which have become synonymous with The Fairmont San Francisco. The Cambridge Suite features a lovely decorative fireplace in a spacious parlour with a BOSE stereo system. 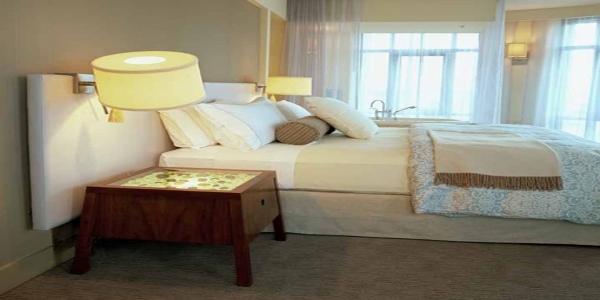 The bedroom has been updated with flat panel TVs, Frette linen ensembles, pillow top beds, and an MP3 docking station. The Cambridge suite also can be connected to an adjoining bedroom (one King bed) to create a two-bedroom suite, based on availability. This spacious San Francisco suite may accommodate up to 20 people for a reception. Having defined the epitome of style and hospitality for more than a century, Fairmont Hotels & Resorts has created the Eco Chic Suite at The Fairmont San Francisco to provide the ultimate urban experience for the environmentally aware traveler. Located in The Fairmont’s famed Tower, the suite marries sumptuous eco-friendly accommodations with the beauty of the outdoor environment. Guests can sleep, eat and drink sustainably while enjoying views of the Bay, the Golden Gate Bridge, Alcatraz and Chinatown framed by large picture windows that wrap around the one-of-a-kind San Francisco suite. The Diplomat Suite at The Fairmont San Francisco is located on the 22nd floor of the Tower. It features a fashionable design including a spacious bedroom, a wet bar, a full stereo system, plasma flat-screen television and a half-bath for guests. The Diplomat Suite accommodates up to 20 people for hospitality functions. This elegant San Francisco suite may also can be connected to a second bedroom with a King bed, based on availability. The Fairmont Suite at The Fairmont San Francisco hotel is located on the 23rd floor of the Tower and offers guests the grandest wrap-around views of the City and the Bay. This one-of-a-kind San Francisco suite features a contemporary design, including a spacious bedroom, a wet bar, a full stereo system, a plasma flat-screen television and two and one-half bathrooms. The master bath has a whirlpool tub with remote control television. The Fairmont Suite accommodates up to 20 people for hospitality functions, and can be connected to a second bedroom with a King bed, based on availability. The extraordinary Penthouse Suite at The Fairmont San Francisco features three large bedrooms; four bathrooms; living room with fireplace, stereo system and plasma screen television; formal dining room; spectacular library; billiard room and an outside terrace overlooking the City and Bay. This exceptional San Francisco Penthouse suite accommodates up to 100 people for entertaining. The Fairmont San Francisco offers three fabulous dining options during your visit to the hotel. Tonga Room & Hurricane Bar offers exotic Asian cuisine, along with the City’s best Mai Tai, in the unforgettable setting of a tropical rainforest. Laurel Court Restaurant & Bar offers a true San Francisco fine dining experience featuring fresh local ingredients paired with one-of-a-kind wines from the area’s top boutique wineries. Inspired by the cafes of Europe, Caffè Cento combines the coffee of illy with the chocolate of Ghirardelli and the hospitality of Fairmont. Tonga Room offers a tropical and festive atmosphere with live entertainment, dancing and a rain storm. Tonga Room serves exceptional Pacific Rim Asian Cuisine in a tropical setting. It is the perfect escape after a busy day of meetings or shopping along Union Square. Be sure to try the Mai Tai, regularly recognized as the City’s best! Friday & Saturday: 6:00 p.m to 11:00 p.m.
Sunday, Wednesday, & Thursday: 5:00 p.m. to 11:30 p.m.
Hurricane Bar guests are welcomed on a first-come first-served basis – no reservations are taken. On Wednesday, Thursday and Friday nights our Happy Hour includes an extensive buffet of Pacific Rim delicacies with items such as mini vegetable egg rolls with Tonga’s secret sauce, scrumptious sesame chicken wings, garlic butter noodles, king prawn crackers with Portuguese sausage dip, green seaweed salad, macaroni salad & assorted tropical fruit with piña colada dip. The all-you-can-eat buffet is a ‘steal’ at only $10.00 per person with an additional one drink minimum. To complement this feast fit for kings and queens, the tropical restaurant and bar serves tantalizing cocktails at Happy Hour prices. As you marvel at the exciting decor, be sure to hold on to your drink during the surprise thunder and lightning. Please enjoy our live entertainment five nights a week – The Island Groove Band playing current popular music. Please keep in mind that once the band starts the cover charge applies to all guests in the restaurant and the bar regardless of the time they arrive. Laurel Court showcases seasonal menus that are authentically local, traditional and innovative. Chef jW Foster has partnered with local farmers for the freshest, seasonal organic produce and free range poultry and eggs, with the finest of ranchers for natural and dry-aged beef, and with Monterey’s Seafood Watch in purchasing from sustainable sources. The Culinary Team produces much of its charcuterie in-house, using traditional cold curing techniques, and handcrafting small batches of such items as sausage, pancetta, and pastrami. Laurel Court features Farm Fresh Salads, Hand-Cut Organic, Dry-Aged Steaks, and Market-Driven Seafood. Breakfast Buffet 6:30 a.m. to 11:30 a.m. Lunch 11:30 a.m. to 2:30 p.m.
Dinner (Monday to Saturday) 6:00 p.m. to 10:00 p.m.
Breakfast Buffet 7:00 a.m. to 1:30 p.m. Afternoon Tea 1:30 p.m. to 3:30 p.m.
Dinner (Saturday Only) 6:00 p.m. to 10:00 p.m. Lounge last call Sunday to Thursday 11:30 p.m.
Limited a la carte menu served daily from 11:30 a.m. to 10:00 p.m. Lounge last call Friday and Saturday 12:30 a.m.
Tonga Room & Hurricane Bar is the ideal spot to celebrate memorable occasions such as birthdays, weddings, anniversaries, graduations and other special events. Rainstorms, thunder and lightning enhance your group dining experience and will turn moments into memories for your guests. The Staff at Tonga Room will work with you to create a memorable and unique event. For more details, please contact the Food & Beverage Office (Monday through Friday 8:00 a.m. to 6:00 p.m.) at (415) 772-5204. Inspired by the cafes of Europe, Caffè Cento combines the coffee of illy with the chocolate of Ghirardelli and the hospitality of Fairmont. In addition to specialty coffees, Caffè Cento also offers a selection of teas, fresh pastries, breakfast and lunch items. Enjoy world class service and culinary offerings in the privacy of your hotel room. Start your day with a freshly baked Croissant or Danish. San Franciscan Omelet or Pear Stuffed French Toast. Our exquisite dinner menu features an array of mouth watering entrees, from Dungeness Crab Chowder to our uniquely farm raised pan seared Barramundi. In-Room Dining can also help you plan special events or small gatherings, in any of our rooms or suites. Or, for that truly memorable event, inquire about The Penthouse. A 6,000 square foot suite with a 2-story rotunda library, billiards room, 3 bedrooms and a formal dining room which seats 24. The In-Room Dining staff will help you plan a truly memorable event. Call In-Room Dining at (415) 772 5189, 24 hours a day. Afternoon Tea has been a tradition for San Franciscans and the guests of our hotel since the opening of the Fairmont San Francisco in 1907. During its tenure, Afternoon Tea Service has been offered at numerous venues throughout the hotel. In 2000, the Laurel Court Restaurant and Bar was returned to its original grandeur as the centerpiece of our beautiful lobby and we are proud to offer traditional Afternoon Tea Service in the same style it was served in the Laurel Court 100 years ago. It is our pleasure to serve you as we continue this grand tradition of impeccable service and delectable treats! Saturdays and Sundays: 1:30 p.m. to 3:30 p.m.